Delegating tasks can reduce workload stress. Feeling overwhelmed as a manager isn't unusual, especially since you not only deal with work demands, but also play the role of supervisor to your subordinates. If the stress is temporary and will lighten once you complete a particular assignment or get through a busy season, it's probably best to cope with your overwhelming feelings until the hectic pace subsides. If your frustrations are a result of ongoing, long-term issues that won't likely change, you may need to make adjustments and find some resolution so stress doesn't get the best of you. If some of your work responsibilities don't require your expertise or stamp of approval, consider sharing them with your employees. Delegate tasks such as researching new products or laws, obtaining general information from clients, filing reports, organizing files and answering phone calls. Some tasks are time-consuming but don't require expert skills, allowing you to focus your attention on more pressing managerial issues. Feeling overwhelmed because you have too many plates spinning is often resolved by allowing your subordinates to help with the work load. That means letting go of the control over some tasks and encouraging others to help carry the load. You might still feel overwhelmed at first -- following up to make sure your employees are doing the job right -- but eventually you'll learn to trust those you've put in charge. If you're overwhelmed because you've been working so hard that you're sleep-deprived, continually battling colds and flu bugs, or stressed because your children are getting the short end of the deal, consider setting some strict parameters at work. According to Forbes.com, women make up more than half the workforce, but spend an average of 12 or more hours a week with their children than with their partners, so it’s no wonder stress levels are rising. As a manager, force yourself to leave the office at a reasonable time every day, take regular lunch breaks, go out of town for the weekend and let your employees know that you're setting some limits. If your subordinates demand too much of your attention, let them know that you'll address concerns in the mornings, but your afternoons must be spent on personal work responsibilities. Your boss probably doesn't want to hear a long list of complaints, but she should be open to an honest discussion about how overwhelmed you feel. Discuss specific concerns or problems that make your job stressful and ask if she has any suggestions. As long as your feelings have sufficient cause and your job performance is high, your boss will likely do what she can to keep you as an employee. According to MayoClinic.com, communicating with your boss honestly and directly with a gentle tone and tempering your comments with diplomacy creates an environment of mutual respect. Let her know that you sincerely appreciate the job and just need some help finding a healthy work balance. If part of your stress is due to a subordinate's poor work habits or difficult personality, this might be a good time to bring it up. Avoid belittling any of your workers and focus on real issues that cause stress in your daily work life. It might not be easy to admit, but you may not be cut out to play a managerial role. This doesn't mean you're a bad employee, it just means that supervisory responsibilities weigh you down. 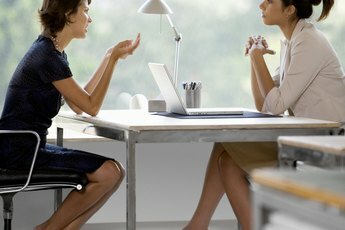 Dealing with subordinates' work habits or behavioral issues, confronting employees about their job performance, communicating with frustrated or angry customers, making sure you stick to tight budgets, and reporting financial highs and lows to executive-level company officials can be stressful. Even if switching to a non-managerial role within the company means a cut in pay, it might be worth it in the long run. Expect a bit of discomfort as those you've supervised get used to your new role. It's not really a demotion as long as you're the one who asked for the change. Forbes.com: Should Overwhelmed Working Women 'Take It Like a Mom' or Ask for Help?